When I started my skirmish warband in October, this was done on the premise of creating it based on the original rules of Age of Sigmar Skirmish. Since January, AoS Skirmish is now more of an extension of the Generals Handbook and in general, with a new Warhammer Underworlds version and the forthcoming Warcry game, the trend seems to be headed towards smaller skirmish boxed games. I'm usually a big fan of little characterful warbands that I can put together myself. For example, I like the combination of Savage Orruks and Spiderfang Grots because they have a nice tribal look. A firm constelation makes the whole thing a bit stiff though. 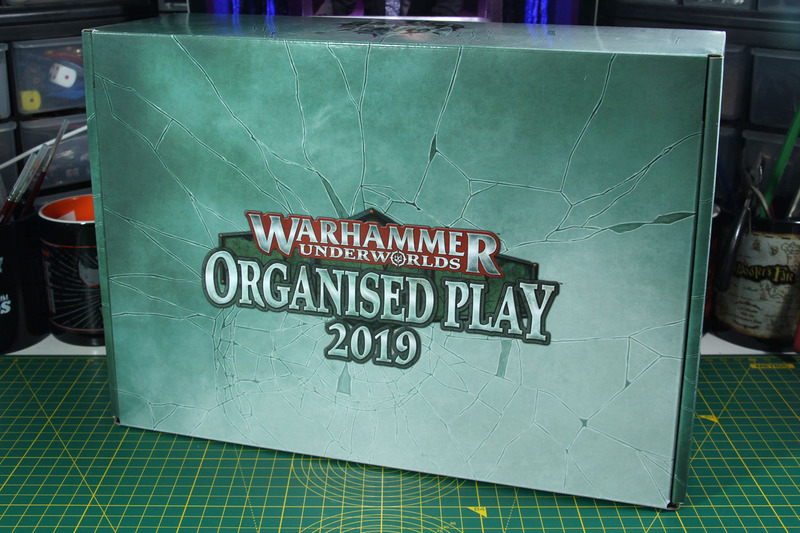 I covered the Organised Play box from the first season of Underworlds, and was able to get my hands on the new 2019 set that was released to support Nightvault. These sets are available to stores as event support sets, and the content should be used as prize support for instore events, like tournaments or leagues. And please let me point this out again, as there were questions about it on the last article. These boxes are meant to be acquired by store owners to support their tournaments and similar events, and not to be sold to players / consumers directly. The items in these boxes are intended to be won, not bought. 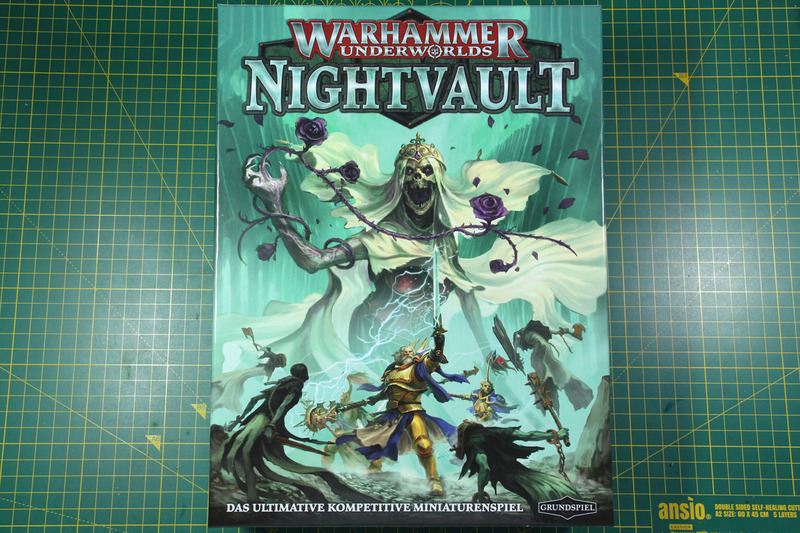 I return to Nightvault, or better said, the Warhammer Underworld series. 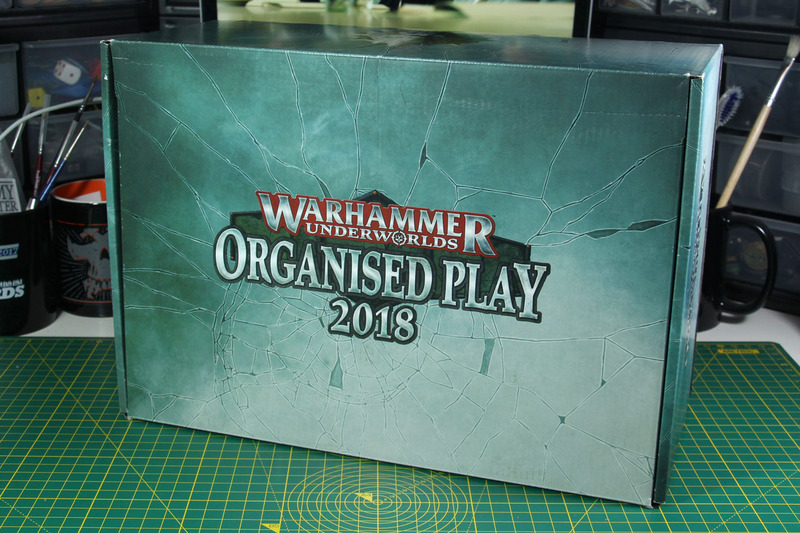 I did an unboxing of the Organised Play 2018 boxed set for the first season Shadespire a couple of days ago. 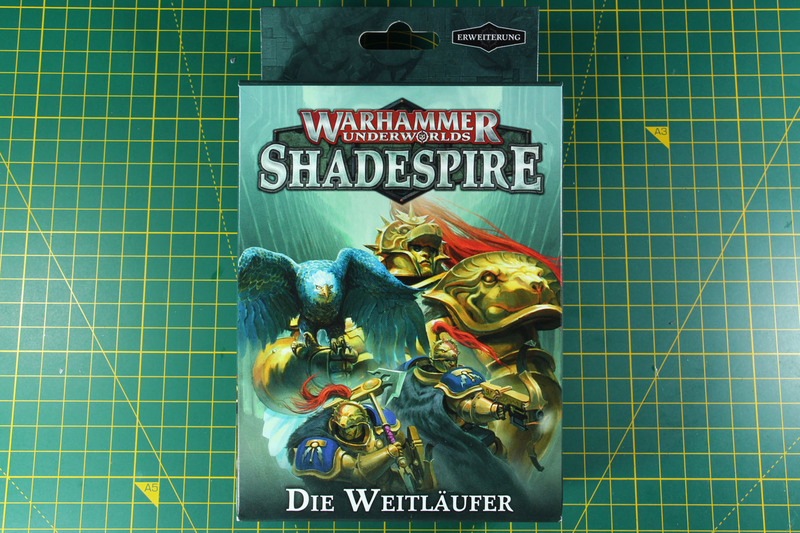 As these were re-packed for the several waves, I could only show you the alternate artwork cards for Steelheart's Champions and Garrek's Reavers. I managed to trade Spiteclaws Swarms alternate artwork cards and would like to show them to you here. 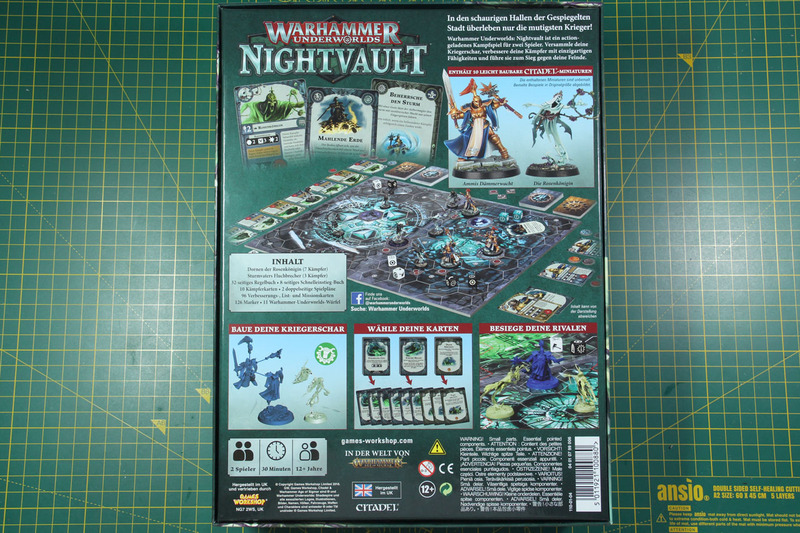 In Summer I've already covered with Shadespire the initial start of the Warhammer Underworlds series, now in autumn the next wave for Nightvault is released. With the release of the Nightvault starter box, the competitive board game goes into its second season. The content is similar to the previous starter box, you receive two warbands, rules, tokens, dice, cards and two boards with hex fields, for 50 EUR. The game is fast paced, so you can play a match in 30-45 minutes and competitive matches are usually decided by the best out of 3 matches in a row. The included warbands come as usual for the Underworlds range in pre-coloured plastic and are push-fit (so you do not need glue to assemble the miniatures). All in all, a self-containing set, focused on competitive players and newcomers to the miniature (board) game hobby alike. 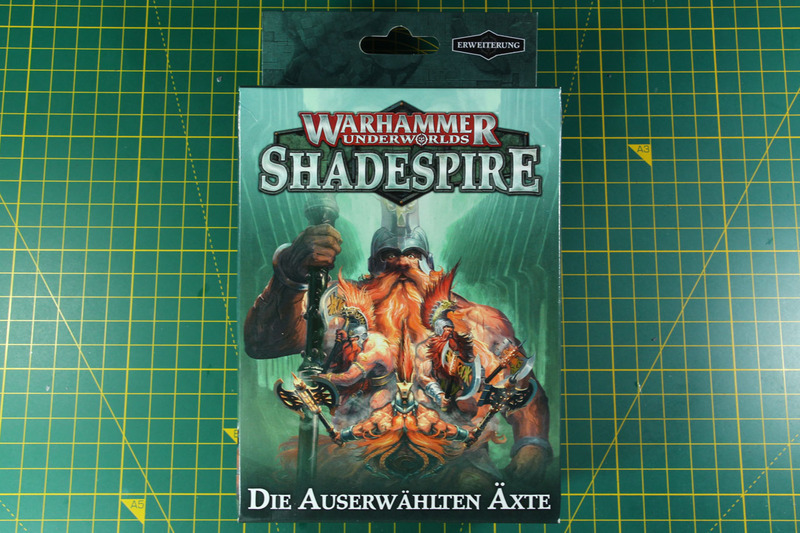 The last of the warband supplements for Warhammer Underworlds Season 1 Shadespire in a review will be the Farstriders. We had Magore's Fiends early this week. Similar as the Fiends picked up the Khorne theme from the starter kit, the Farstriders pick up with the Stormcast Eternals from the same set. The Farstriders are the first warband to actually cover shooting / ranged combat in Warhammer Underworlds. But they won't be the last to do so, for sure. Actually as the Farstriders are Vanguard-Hunters, the next Stormcasts that are part of the Season 2 starter set Nightvault will introduce Evocators as a warband and magic as a new component. But let us take a look what the Vanguard-Hunters around Hunter-Prime Sanson Farstrider bring to the table. As a highly trained, elite group of warriors, it is no surprise that they are only three men strong. 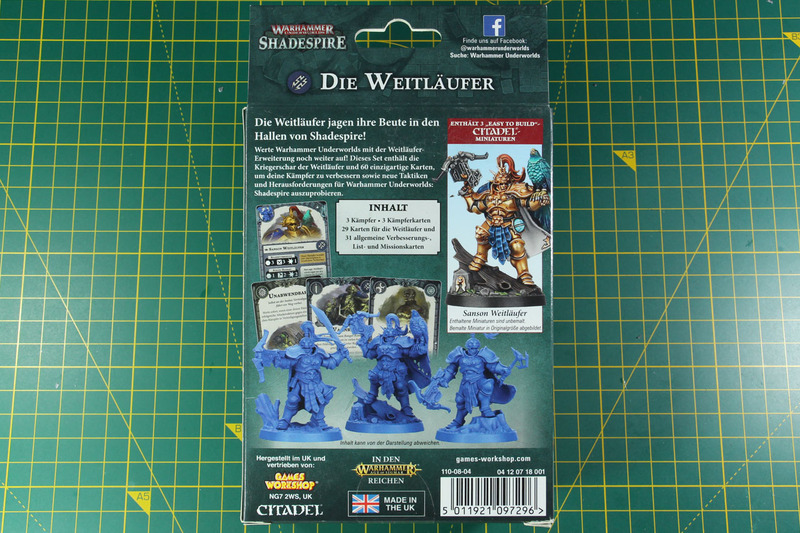 Priced at the usual 22.50 EUR for an Underworlds warband supplement or 20.00 EUR for the easy-to-build box without the cards. The Underworlds box covers two pre-coloured bright blue sprues, a deck of cards and an assembly leaflet. 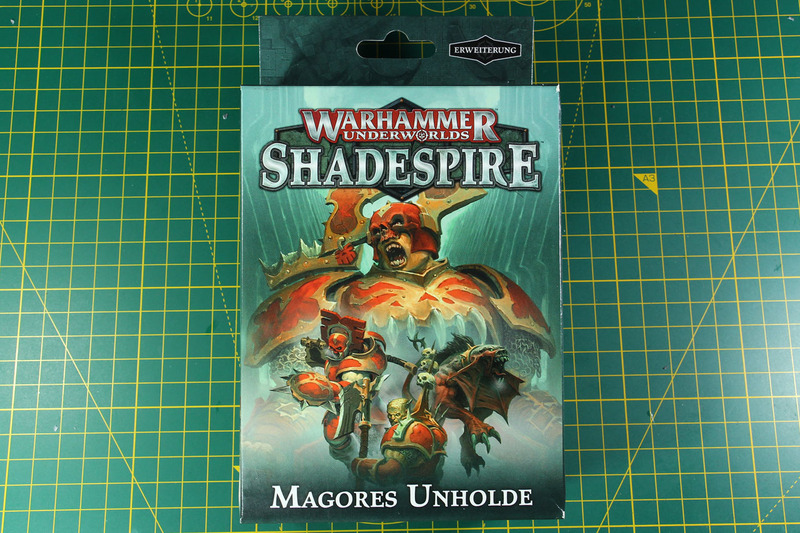 The last duo of the Shadespire warbands I'll cover will be Magore's Fiends and the Farstriders, beginning in today's review with the Fiends. These kits stay with the factions that introduced the first season of Warhammer Underworlds, Stormcast and Khorne followers. Magore's Fiends are a warband with 4 miniatures, three Blood Warriors and a Flesh Hound of Khorne. The warband supplement from the first season Shadespire costs 22.50 EUR incl. the Underworlds content or 20.00 EUR as an Easy-to-Build kit. 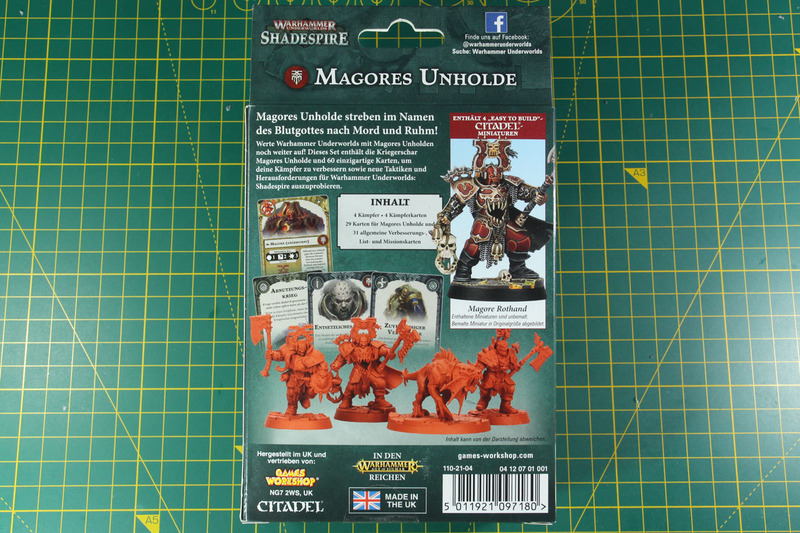 This box covers two blood-red pre-coloured sprues, a card deck and brief instructions on the assembly. 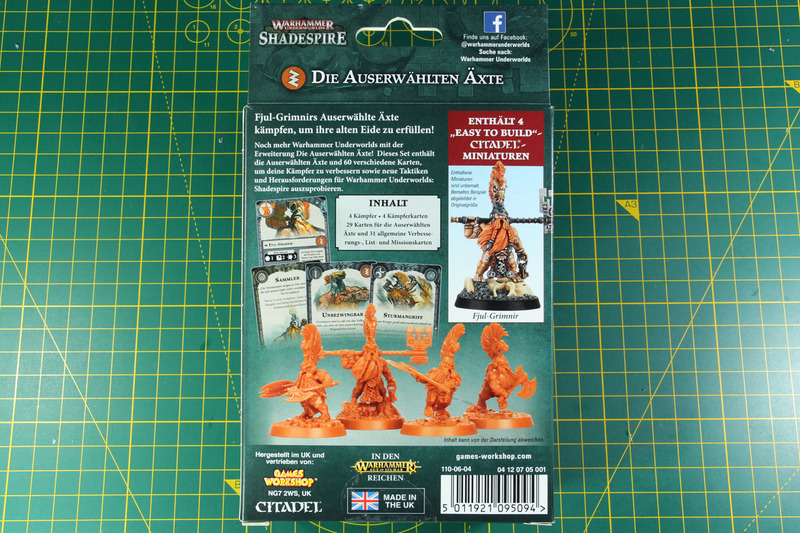 The matching counterparts to the Duardins of The Chosen Axes are the Skaven of Spiteclaw's Swarm. The Skaven, almost human sized rat-men, are one of the few (if not the only) faction that kept their name during The End Times and the introduction of Age of Sigmar. As the "existence" of these giant rats is still argued about in the lore (in the records of the human realms the sights of Skaven is continouisly dismissed and the people who saw them simply labelled as insane), they live in the ground, in dens and caves, and sometimes these large underground settlements cross the cities, deep in the mountains of the dwarfs / Duardin, making the two a fitting bundle for this release of Shadespire. 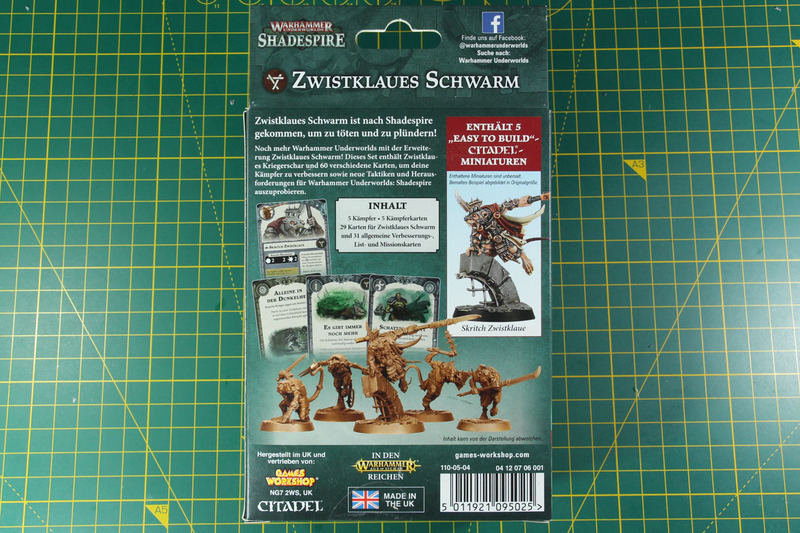 The warband expansion of Spiteclaw's Swarm consists of 4 Skaven clan rats and Skritch Spiteclaw himself. It is set at a price tag of 22.50 EUR and contains two pre-coloured sprues in brown, a card deck and brief instructions on the assembly. 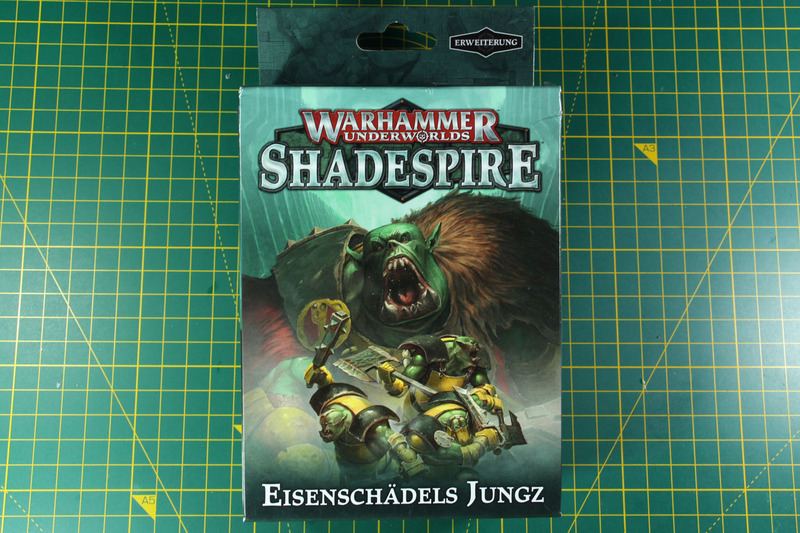 The card deck covers 65 cards, 5 cards for the warband itself, 29 are unique cards for the Orruk warband and 31 universal cards (split across objectives, upgrades and ploys) to be used with any Warhammer Underworlds warband. 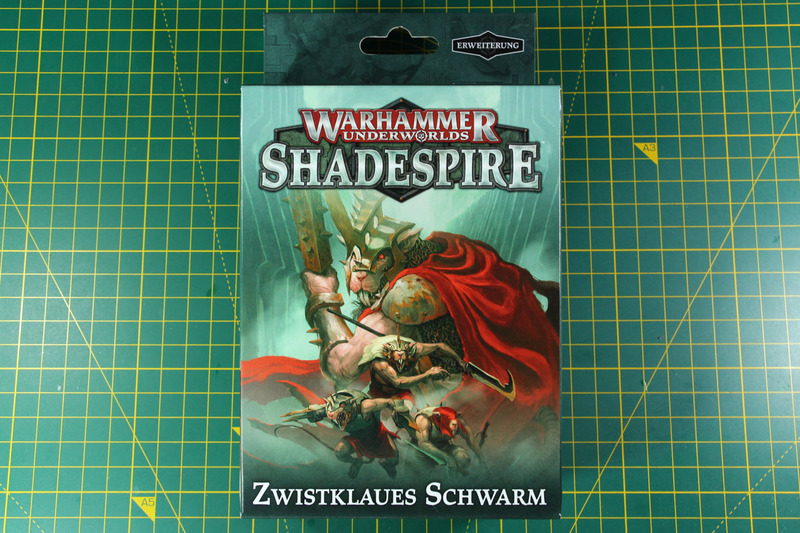 The next double of the Shadespire warband extensions, after the Sepulchral Guard and Ironskulls's Boyz, will be The Chosen Axes and Spikeclaw's Swarm, beginning with the Fyreslayers. The Fyreslayers are part of the Duardin race and are searching for the Ur-Gold, the remains of their god Grimnir. Grimnir fell when he fought Vulcatrix, the mother of Salamanders, and burst into the metallic shards of Ur-Gold. The Ur-Gold is accepted by the Fyreslayers as payment for their mercenary duty (they will fight against and alongside anyone as long as the payment fits) and can be forged by the Runemasters into mighty runes. As such even the rumours of Ur-Gold in the mirrored city is motivation enough for any Fyreslayer to go on this journey. Where there is chaos and destruction, Orruks cannot be far away. 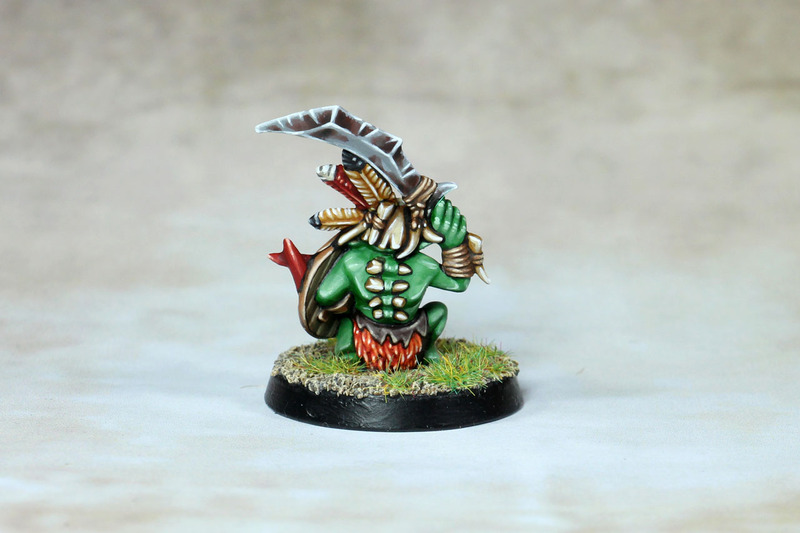 Somewhat close to the Khorne Bloodbound warbands (Reavers and Fiends) in their intention / motivation, we see what separates the Green from the Red, in this review on the Shadespire warband of Ironskull's Boyz. Earlier this week, I started the coverage on the Shadespire warbands with the Sepulchral Guard. 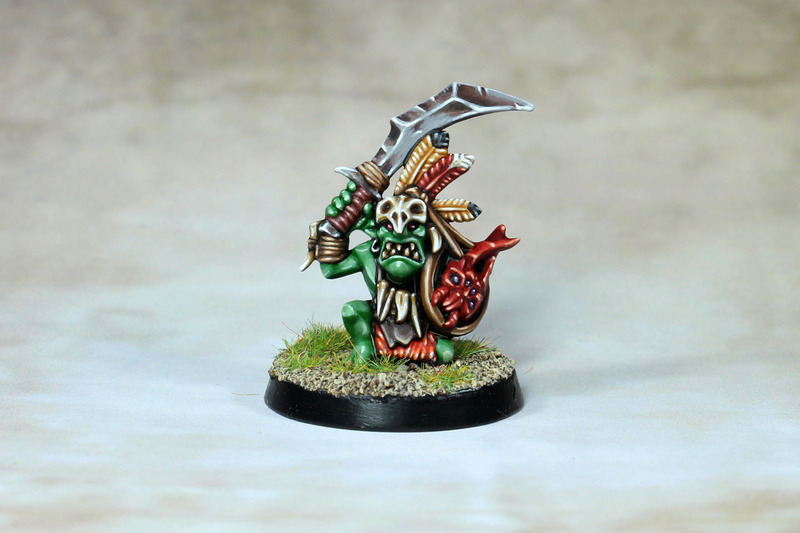 Ironskull's Boyz is a 4 Orruk strong warband expansion for Warhammer Underworlds Shadespire and costs 22.50 EUR. 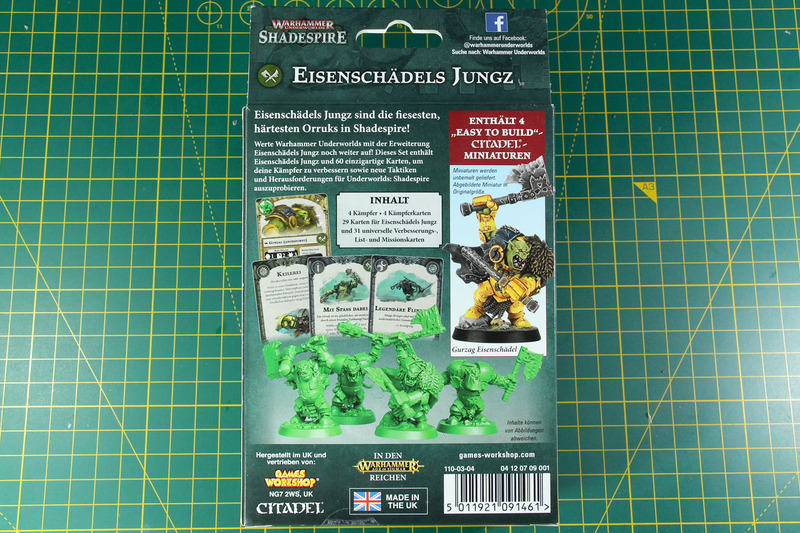 It comes with the pre-coloured two sprues (in matching orcish green! 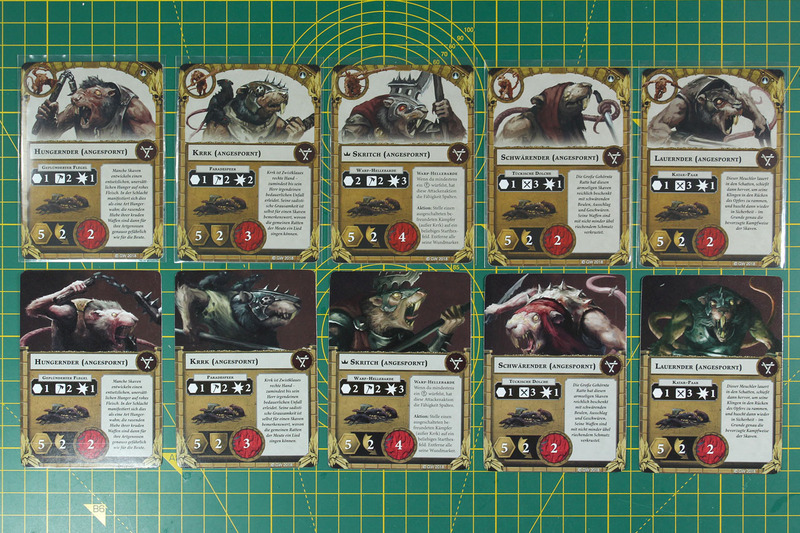 ), a card deck and brief instructions on the assembly.